Pilates? How do I get started? So you are ready to start a Pilates practice but how do you begin? First find qualified, certified instructors. Make sure they have a certification from an accredited institution such as STOTT Pilates or Balanced Body. Instructors who are certified by these organizations spend many hours getting educated in the method. Then there are written and practical exams that they must pass in order to achieve their certification. After passing, they must continue their education by achieving continuing education credits to maintain their certifications. These people will know their stuff. Once you have found a qualified instructor, take a basics course where you will learn the principles of the method. These principles are the key to the practice. They must be understood and applied to every single exercise. 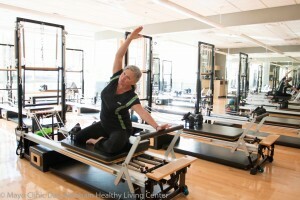 The DAHLC offers Pilates Foundations. After you have learned the principles, learn the matwork. Pilates matwork is comprised of exercises done on a mat with just your body – no equipment. Your spine will move in all directions: forward, backward, rotationally, and sideways. Core strength will grow over time if the principles are applied to every exercise. After some initial core strength has been built, consider stepping into the world of machine based Pilates. This includes the Pilates Reformer often referred as the central piece to any Pilates practice. The Pilates Reformer is a versatile machine that will still move the spine in many directions but has the capability to add resistance to the exercises. Muscles not only gain strength but flexibility. So there you go – a map on how to begin your Pilates practice. Now get on the road and begin! You won’t regret the journey!